The US military has used the same basic bolo knife for quite some time, ranging from the turn of the 20th century to World War II. 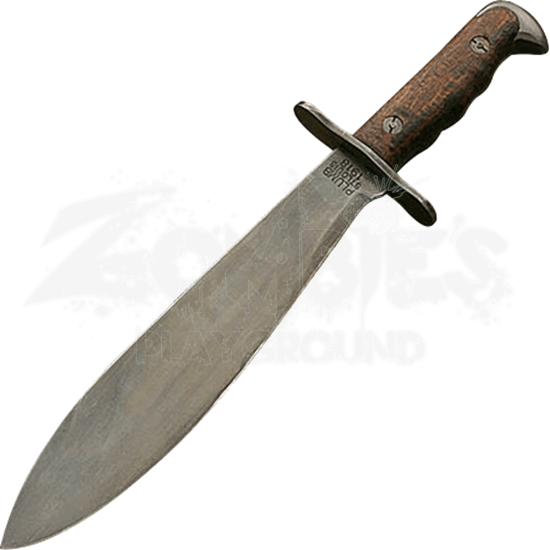 This US Model 1917 Bolo Knife is a functional replica of one such knife that features a simple yet rugged military look. Modeled after the classic bolo knife, this military blade possesses a leaf-shaped blade that is wider near the tip, giving this knife an impressive level of weight and impact when swung. The blade is crafted from high carbon steel, and it features a factory edge that is rather sharp along both sides. The blade is less-suited for thrusting, although the broad point ensures that a successful thrust is still a potentially deadly attack. The right side of the blade is stamped with the phrase US MOD 1917 CT while the left is stamped with the phrase PLUMP STLOUIS 1918. The tang is fully integrated with the handle, having been sandwiched between two dark, close-grained wood grips that are secured together via two large bolts. The knife includes a scabbard that is covered in heavy canvas and features a heavy-duty brass throat piece, as well as a brass throat hanger that works well with all standard web belts. The bolo has always been a great blade to use, and when combined with military efficiency, it was better than great. This US Model 1917 Bolo Knife resurrects an old yet useful knife design and brings it into the modern era with few changes, allowing survivalists and woodsman of all ages to pick up and enjoy this rugged and effective knife. Overall Weight: 1 lb. 6 oz.